News flash: On Saturday morning, I won the Rhinebeck Hudson Valley Half Marathon. Don’t misunderstand me: I didn’t run it or anything. But I stood on my front stoop in the rain, blasted Bob Seger’s “Against the Wind,” called affirmations to every athlete passing by and — most importantly — had the best-looking sidekick this side of Poughkeepsie. I think we can all agree that’s #winning. Best friends always color coordinate. I hadn’t expected to enjoy myself so much spectating the event. In fact, just three weeks before, I’d cursed that very same race when I realized 1. It was passing right by my house and 2. I wasn’t in good enough shape to join it. I’ve largely let running go by the wayside since the NYC Half Marathon in March, and while I usually pride myself in being able to churn out a sub-2 half with little to no extra training, I knew deep in my soul I wasn’t in good enough shape to finish this weekend’s race and feel good doing it. 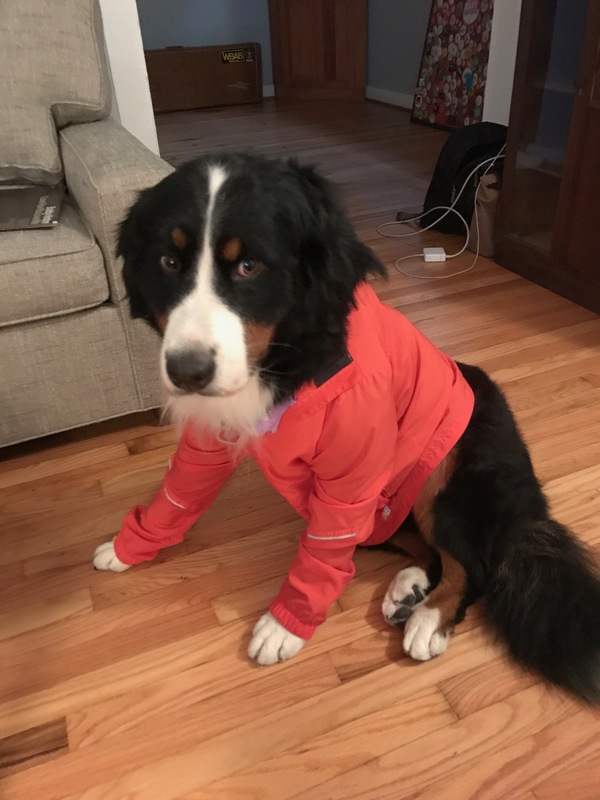 Actually, for a brief minute, I tricked myself into thinking I could: I pictured hustling back into shape, wrote down actual workouts in my google calendar, devised ways to replace rest days with extra long runs, and ran an impromptu seven-miler after a month on the couch just to show myself I still had it. And — ooooh — the punishment shin splints have been relentless. Never go from zero to seven, people, NEVER. So I quickly scrapped that plan (and have been wearing sneakers every day since waiting for the shin pain to subside…) and decided to reimagine myself cheering alongside the race course instead. And I’m so glad I did. I’m not sure about the other 13.1 miles (or 26.2 miles for the simultaneous full), but I was the only spectator as far as the eye could see on my stretch of road. And having been on the other side, I know just how good a “looking good, runner!” can feel when you’re powering up a hill in the rain counting down the miles til the finish line. 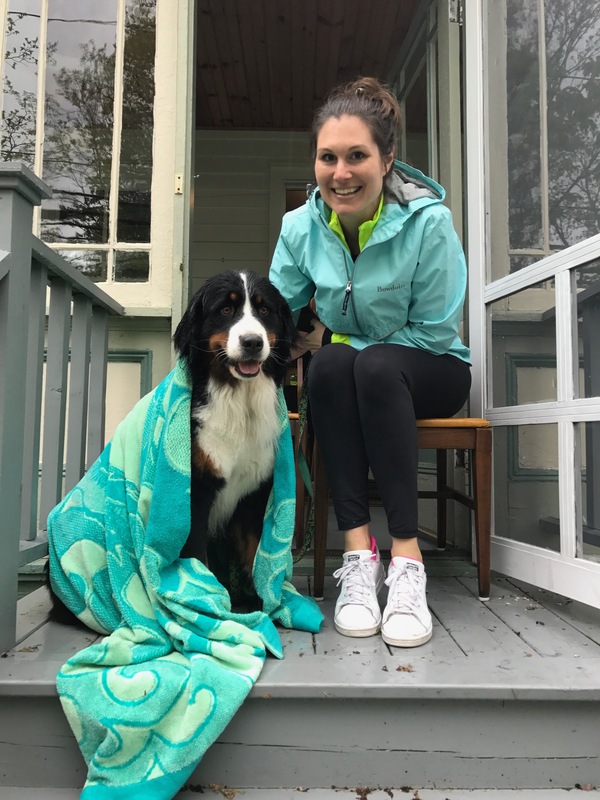 Plus a bernese wrapped in a beach towel makes everyone laugh. So what did I learn this past weekend? That cheering at a race can be just as fun as running one, without any of the pesky recovery time. And that telling an environmentally friendly runner she can toss her empty gel in your yard elicits so much gratitude. And that Lucille and I wear the same size raincoat but she refuses to be seen outside in it. But most of all, Saturday taught me when the area’s October half marathon rolls through town, I’m gonna be ready this time. Don’t believe me? I already registered. 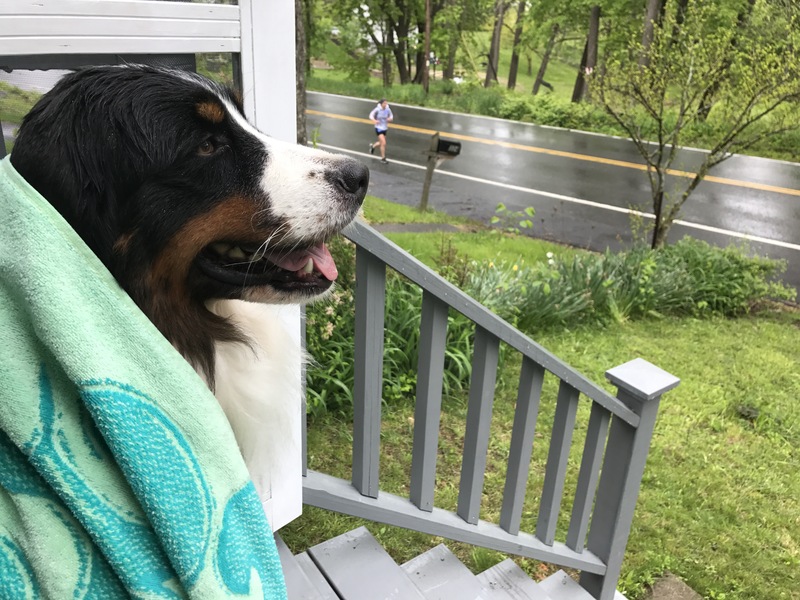 This entry was posted in Races and tagged bernese, cheering, dog, half marathon, Rhinebeck, spectator. Bookmark the permalink.